Connection Ubuntu seeks to supply both donated and purchased laptops and tablets to students and entrepreneurs in Africa. These tools allow recipients to gain technical knowledge and confidence to achieve their dreams of success and self-sufficiency. While access to technology is a part of daily life for most of us in the U.S., only an estimated 2% of rural Kenyans have ever touched a computer. 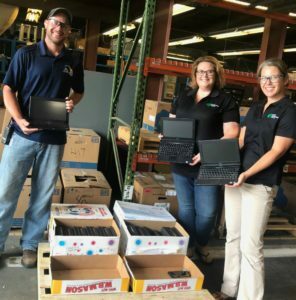 The CTC donated 30 refurbished netbooks that will be used to set-up a computer lab in rural Kenya and 10 refurbished desktops that will help students at Advanced College in South Africa. 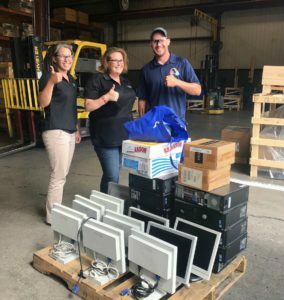 Connection Ubuntu works closely with EVAPCO, as the organization’s Founder Vicki Poole is also a 29-year employee of this local manufacturing company. EVAPCO greatly reduces the cost of transporting these computers by including them in regular container shipments to their facility in South Africa. Yeah, teamwork!